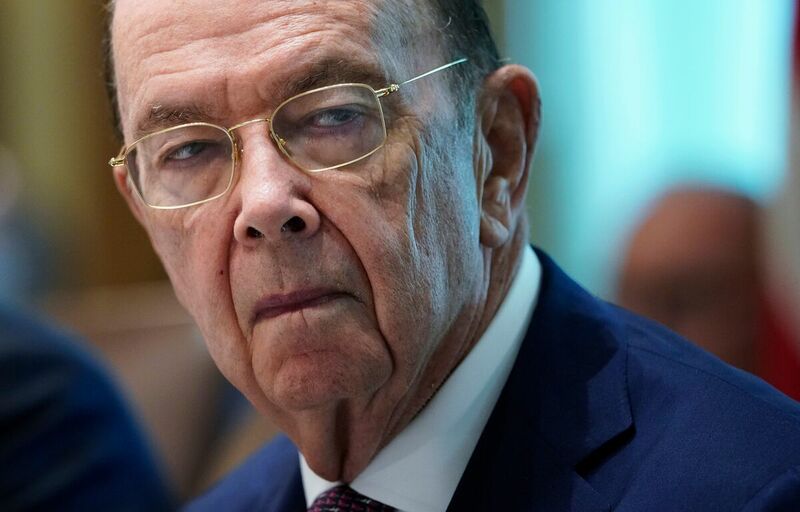 Judge Orders Commerce Secretary To Testify About Census Citizenship Question A federal judge in New York has ordered Commerce Secretary Wilbur Ross to face questioning under oath over his decision to add a controversial citizenship question to the 2020 census. Commerce Secretary Wilbur Ross, whose department oversees the Census Bureau, approved adding a question about U.S. citizenship status to the 2020 census. A federal judge has ordered the Trump administration to make its main official behind the 2020 census citizenship question — Commerce Secretary Wilbur Ross — available to testify out of court for the lawsuits over the hotly contested question. "Secretary Ross must sit for a deposition because, among other things, his intent and credibility are directly at issue in these cases," U.S. District Judge Jesse Furman wrote in an opinion filed Friday with Manhattan federal court. Furman has limited questioning of Ross by the plaintiffs' attorneys to four hours, noting that the commerce secretary has already testified in Congress and the administration has released a record of internal documents about his decision to add the citizenship question. The Commerce Department, which oversees the census, declined to comment on the judge's order. Devin O'Malley, a spokesperson for the Justice Department, which is representing the Commerce Department and the Census Bureau, also declined to comment. Ross has said that the Justice Department needs responses from a citizenship question on the census to better enforce the Voting Rights Act's protections against racial discrimination. But the plaintiffs question that reasoning. They point out that the government has relied on estimates of voting-age citizens from a survey now known as the American Community Survey, which the Census Bureau also conducts, ever since the Voting Rights Act was enacted in 1965. "DOJ has no need for a door-to-door inquiry of the citizenship status of every member of every household in America," said Dale Ho, one of the plaintiffs' attorneys who leads the ACLU's Voting Rights Project, in a written statement. "We look forward to getting answers under oath about the Trump administration's real agenda: attacking immigrant communities." DOJ lawyers have previously warned they are gearing up to ask the 2nd U.S. Circuit Court of Appeals to block Furman's order. "Plaintiffs' demand for a Cabinet Secretary's deposition is extraordinary, unnecessary, and unsupported," the government's attorneys wrote in a recent court filing, suggesting instead that Ross could provide written responses to questions or have another Commerce official testify on behalf of him and the department. Judge Furman, however, stressed that a deposition of Ross is in the public interest for transparency. "There is something surprising, if not unsettling, about Defendants' aggressive efforts to shield Secretary Ross from having to answer questions about his conduct in adding the citizenship question to the census questionnaire," the judge wrote in his order. More than two dozen states and cities, as well as other groups, are suing the Census Bureau and the Commerce Department, which oversees the census, to get the citizenship question removed. They have filed a total of six lawsuits around the country that are likely to spill into the final months of preparation for the census, the constitutionally mandated head count of every person living in the U.S.
Time is winding down for the plaintiffs' attorneys to gather evidence to prove their claims against Ross, whom they say misused his authority over the census and, by adding the question to forms for the upcoming national head count, discriminates against immigrant communities of color. The discovery process for the two lawsuits based in New York is set to end on Oct. 12, ahead of a potential trial starting on Nov. 5. Ross announced his decision in March to add the question, "Is this person a citizen of the United States?" He overruled research by the Census Bureau's chief scientist and other researchers that suggests asking about citizenship status at a time of increased anti-immigrant rhetoric and immigration enforcement under the Trump administration could result in fewer households with noncitizens taking part in the census. Population counts from the census are directly tied to how states share political power in the U.S. An undercount of noncitizens, including immigrants who are living in the U.S. illegally, could reshape how congressional seats and Electoral College votes are distributed among the states over the next decade. The plaintiffs' attorneys in New York have been urging Furman to force Ross' deposition after multiple Commerce officials testified they could not recall internal discussions about the question that are documented in emails and memos released as part of the lawsuits. "The details of Secretary Ross's personal involvement are not available through any other source [sic]," the attorneys wrote in a recent court filing. Earlier this month, DOJ attorneys were successful in getting a federal circuit judge to temporarily block a deposition Furman ordered of John Gore, the acting head of the Justice Department's civil rights division. That is the division that says it needs the citizenship question to better enforce the Voting Rights Act. The circuit court has not yet issued a final ruling on whether Gore can be deposed.